How many aluminum cans does it take to build a home? That’s the question Ashley Gravlee, manager of corporate social responsibility at Novelis, thinks about every day. Novelis is the leading producer of flat-rolled aluminum products and the world’s largest aluminum recycler. And Ashley will tell you that, although aluminum is infinitely recyclable, $1.5 billion worth of aluminum ends up in landfills every year. That's a lot of money and resources wasted. Novelis wants to put those cans to better use. So the company is encouraging people in Georgia, where Novelis is headquartered, to recycle more. And for every 3 million cans the company collects — about $80,000 worth — Novelis is building a Habitat for Humanity home near Mercedes-Benz Stadium. “You can never look at a can the same way again,” Ashley told us. We wanted to know more about what drives Ashley day in and day out, so as part of our My Passion, My Purpose series, we asked her a series of questions about who she is and why she gives. Q: Your first 8 seconds of good: As a child I lived in Germany, and I remember working with my family to collect and sort clothing, toiletries and my personal favorite — chocolate — to send to orphanages in Romania. Q: Your most recent 8 seconds of good: Working alongside colleagues to fill 400 backpacks as part of Agape’s Great Backpack Giveaway, serving underprivileged youth in the Atlanta community. It made me remember the simple joy I felt as a child when I would pick out a new box of markers and the nervous excitement I felt as the first day of each new school year approached. Every child deserves to feel prepared and confident on their first day of school! Q: What good will you do next? 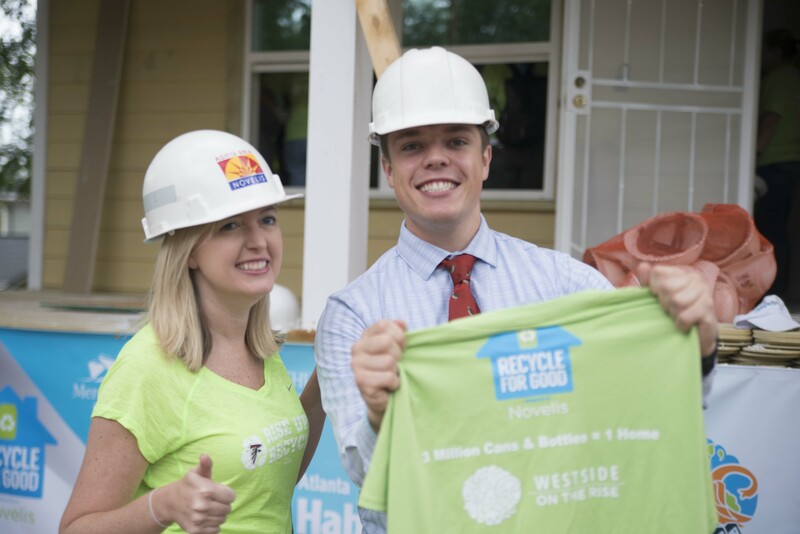 Through Novelis’ partnership with the Atlanta Falcons and the new Mercedes-Benz Stadium, I am focused on driving momentum in year two of our Recycle for Good initiative, which uses the value of recycled aluminum cans consumed in the stadium by fans and donated by community organizations to completely fund a Habitat for Humanity home for a local Atlanta family. I can’t wait to meet the home buyer and his/her family for our second home! Q: Your passion: Helping and inspiring others to give of their time and talents to a cause they care about, and seeing their passion and ingenuity grow as a result. I’m also very passionate about ensuring Novelis contributes to our communities in ways that make our exceptionally talented and earnest people proud of the company for which they work. Q: Your purpose: Be a conduit for good through connecting people with opportunities to be catalysts for good. Q: Who do you challenge next? I challenge Jane Mosbacher Morris — the founder of To the Market — and a global catalyst for good. Jane has the most amazing experiences and heart — from working in counterterrorism in D.C. to now helping vulnerable communities of women artisans obtain the platform and infrastructure needed to get their beautifully crafted goods in front of millions of consumers. Keep inspiring us, Jane!